I have wanted to write a new blog on immigration for some time now. Especially since I think there are politicians in both parties using it as a political scare tactic rather than looking for real and tough solutions that keep us a rule of law nation without ignoring the human impact of decisions about what to do about the 12 million people here illegally. Then, today I saw a speech by Marco Rubio in which he said everything that I wanted to say, and much more elloquently and impactfully than I could ever say it. If this isn’t Purple Ground, I don’t know what is. Warning: This post is rated S for heavy use of sarcasm. We have a unique brand of crazy here in California – a special hubris that believes that regulators and bureaucrats can change the future and steer technology and the economy by sheer force of will. Just read California news for 20 minutes and you’ll see what I mean. California has a $26 billion annual budget deficit. Not to mention the $10 billion that we are in the hole to the federal government for loans to cover extended unemployment benefits. No worries though, Governor Brown has a plan to squeeze that money out of job creators by boosting employer contributions for unemployment insurance by 9% next year and 14% the following year. It’s not like increased taxes and a higher cost of doing business will drive more businesses out of California though. 1. The California Air Resources Board (CARB) mandates that 15% of all cars offered for sale must be alternative fuel vehicles (AFVs) by 2025. (See LA Times Article). If you’re like me, the first thing you’re asking yourself is “how can CARB predict / control the number of electric cars that consumers choose to purchase by a date certain?” The answer: They can’t. 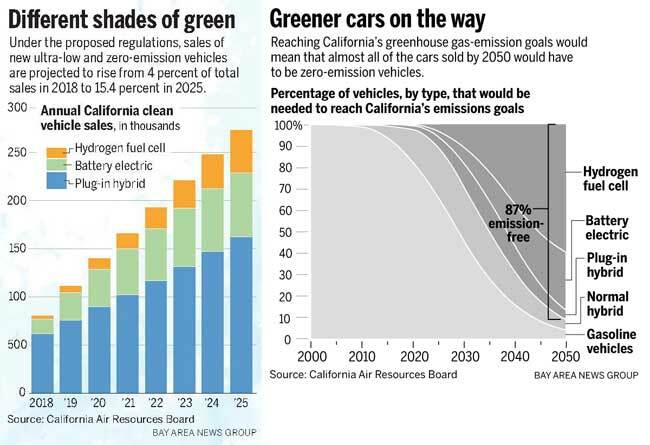 California isn’t mandating that consumers buy these cars (yet), only that 15% of the cars offered for sale by any dealer at any given time be alternative fuel vehicles. So what if consumer demand doesn’t meet 15% by 2025? (Today less than half of 1% of vehicles purchased in California are AFVs.) Well, either the dealers will be stuck with inventory that they can’t move, putting them out of business, or the government will have to further subsidize the cost of the cars to incentivize demand. Side note, did you know that up to $250,000 in government subsidies (re: our tax money) goes into every Chevy Volt sold? Good thing that Washington isn’t broke. As a country, there is no doubt that we are moving towards more eco-friendly cars. People want energy independence, to spend less on gas and to be friendly to the planet. But the reality is that the technology for alternative fuel vehicles isn’t quite up to snuff yet. Consumers will buy AFVs in mass when they are price comparable, can go more than 80 miles on one charge, have the infrastructure to recharge quickly on the go (because it now takes 30 minutes), and come in attractive models. The good news? We are well on the way! The wonderful thing about a free market economy is that when the public demands it, the private market figures out a way to provide it. Maybe we will be there by 2025, maybe not. 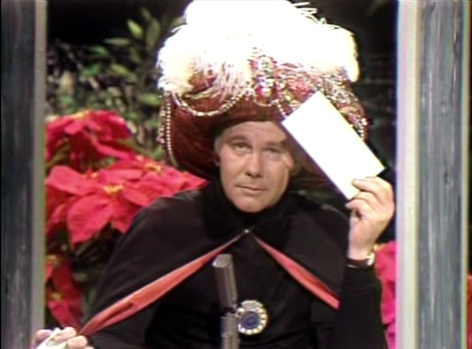 The only ones that know for sure are Carnac the Magnificent and apparently the California Air Resources Board. 2. Governor Brown doubles down on high-speed rail, despite lack of funding and ballooning costs. (See LA Times Article). In 2008, California voters approved a ballot measure for a high-speed rail in California with a price tag of $25 billion. Today, the final cost is estimated at over $100 billion (not including maintenance costs), with no funding in sight. Is there demand for the high-speed rail that would make it a profitable or at a least self-sustaining venture? Great question. IDK, no one does, but does it really matter? According to Governor Brown, we need this train to prevent California from becoming a third world country. The governors of Wisconsin, Ohio and Florida all nixed their high speed rail projects over concerns that the projects did not make fiscal sense. They apparently did not understand that without the new trains they will become like Bangladesh or Ethiopia. Also, we probably shouldn’t use Amtrak as a predictive model. The government spends an average of $32 per passenger subsiding Amtrak and 41 of the railroad’s 44 lines lose money. Does that fall into the category of bailing out failing businesses? I’m just asking…. So anyway, Governor Moonbeam is now the only state leader left in America on the quixotic quest for high-speed rail travel at any cost, whether California commuters will use it or not. Fear not though, Governor Brown is about to close the budget deficit with a combination of $12.5 billion in cuts and $12 billion in tax increases. That is, as long as voters approve those tax increases in the next election. And why wouldn’t we? It’s not like the money could be found anywhere other than tax-payers’ wallets. Matter of fact, the Governor has put together a “Plan B” if the voters reject the tax increases that will take money out of K-12 education, cutting the school year by three weeks. Coincidentally, public opinion polls consistently show that California voters are willing to pay higher taxes if they know the money will be dedicated to public education. At the same time, a recent statewide survey shows voters remain deeply suspicious of state spending and believe the government should be doing more with less. Here’s a crazy notion: how about California legislators do less with less? 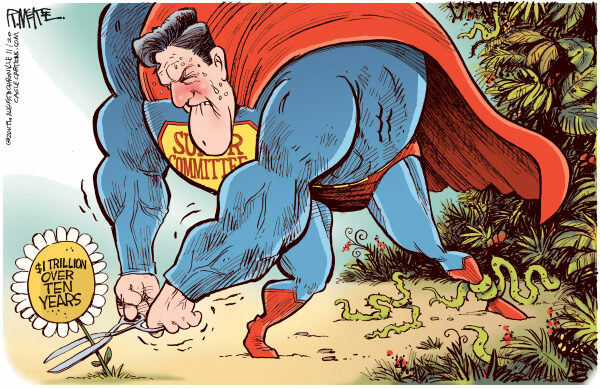 If ever there were a poorly named experiment in political dysfunction, it must be the “Super Committee”. The antonyms of “super” are a better fit for the political pansies in our legislature. Consider that these twelve “statesmen” were asked to cut $1.4 trillion out of the 10-year federal budget of $44 trillion. And they failed. Now the super-blaming and super-spinning begins. And the real losers are the American people. I understand that there are deep philosophical divides between the Democrat and Republican parties, but this fiscal insanity is something that we are truly all in together. Ask the Greeks, the Italians or the Spaniards how fun it will be if we keep kicking this deficit can down the road. I thought the whole idea of these “triggers” was to force this Super Committee to get the job done with consequences of failure too horrible to abide. (Keep in mind, we only had a Super Committee because the rest of congress refused to do the hard work of making tough decisions and compromises.) Well, it turns out that the triggers may or may not be mutable and they don’t go into effect until year after next anyway, so congress feels like they have time to wriggle out of yet another deadline. So they punt. Again. And blame each other. Again. I bet if we charged each member of congress $5,000 per day that the deficit wasn’t cut, they would all find a way to make it happen. That would be a real trigger. Meanwhile, the rest of us out here in the real world know what it is like to make extremely painful budget cuts in our own lives. We know what it is like to have to work with people we don’t like or agree with and make compromises on matters that are important to us. Where is the leadership in this country? Where are the ones standing up and saying, “I will do what needs to be done regardless of the effect on my poll numbers, whether or not my party’s special interests agree; I will do what needs to be done for the future of this country.” Congress has a 12% approval rating and I am pretty sure that 12% is composed of congressional staffers, family members, friends, well paid lobbyists, the cast of the Jersey Shore and newly awake coma patients. I for one am disgusted. So I will fight back the only way I know how: I will not contribute to any member of congress or political party; I will vote all the bums out that I can; and I will blog. At least the latter is cathartic. But it’s a sad day when what unites red and blue Americans is disgust for their elected officials. Who decided that all injustices in the world are the responsibility of the federal government to rectify? What makes us think that the federal government is better at managing our lives and our businesses than we are? Like many people, I am still digging into the details of the President’s Jobs Bill to evaluate it on its merits. However, the bill may be DOA in it’s current form as it doesn’t even have enough support from Democrats in the Senate to pass, let alone the GOP-controlled house. One thing that I leanred in the last few days may be a small clue as to why: There is a new law in the bill that would prohibit employers from discriminating against those applicants who have been unemployed for an extended period of time. You can read about the provision in the Washington Post’s article. Apparently some companies and job agencies prefer applicants who already have jobs, or haven’t been jobless too long. Perhaps they have a perception (real or imagined) that the chronically unemployed are lazy, off their game, or not as motivated. 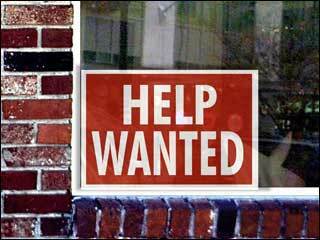 The National Employment Law Project did a survey earlier this year that found more than 150 job postings on employment Web sites such as CareerBuilder.com and Monster.com requiring that applicants “must be currently employed” or other requirements for current or recent employment status. Keep in mind, that’s 150 out of tens of thousands of job postings – not exactly an epidemic. But here I want to point out the arrogance of government to think that they know best who employers should be hiring. Businesses want to hire the best person for the job. Period. Whatever criteria goes into their decision making process is none of the government’s business. To think that some politician on Capitol Hill knows more about who a business should hire than the business owner does is the height of arrogance and government overreach. Here, the Powers That Be are going to tell businesses not just that they can’t discriminate on things like race, religion, gender, sexual orientation or disability (protected classes in the Equal Employment Opportunity Act); they are actually going to tell businesses that they cannot discriminate against the circumstances or the applicant. This is how, in their quest to create jobs, government stifles job creation. Because government doesn’t create jobs, private enterprise does. The best thing that government can do is create a good environment for private sector creation, which mostly means getting out of the way. As the Washington Post article points out, this new law opens up businesses to retribution from disgruntled applicants who didn’t get the job they wanted. Anyone who has been unemployed can accuse the company of discrimination and file a lawsuit. “The effort to protect the unemployed has drawn praise from workers’ rights advocates, but business groups say it will just stir up needless litigation by frustrated job applicants. The provision would give those claiming discrimination a right to sue, and violators would face fines of up to $1,000 per day, plus attorney fees and costs. It seems that government is better at burdening business than empowering it. The new healthcare bill adds substantial costs to businesses.Starting in 2014, businesses with more than 50 employees will be required to either offer healthcare coverage or pay a penalty of $2000 a year per full-time worker. The coverage offered will also have to meet minimum benefits — covering both a specific set of services and 60% of employee health costs overall — or else employers will face additional penalties. Free enterprise has made America the most prosperous country on earth. The role of the federal government is to protect our right to life liberty and the pursuit of happiness, not to tell business who to hire and what benefits they must offer. Besides being a drain on business, excessive government involvement in private enterprise is a perfect example of the hubris of bureaucrats and elected officials thinking that: a) they know best and b) they can micromanage American business. From what I have seen, Washington doesn’t run anything very well, including Washington. I realize that I haven’t written a blog in months. It was this whole quit my job, start my own business thing that got in the way. I still think of things that I want to say and I often look for the purple ground on issues when I am watching or reading the news. But I guess it took something extra ridiculous to motivate me to finally get back to the blog. Sounds like common sense to me. The law also says that it is not to be applied against portions of curriculum that contain individual lessons about particular groups and historical events such as the holocaust. Raza (the race) Studies. This course teaches that the United States stole the southwest from Mexico, that the Pilgrims brought plagues to intentionally wipe out indigenous peoples, and that Thanksgiving should be changed to a day of atonement for the evil that the U.S. perpetrated on the Mexican people. We are a land of immigrants, and that fact has made us strong as a country. Matter of fact, we are such a new country compared to the rest of the world that, Native Americans aside, we could all hyphenate our names back to some other country of origin by going back only a few short generations. What unites us as a nation is the idea that we are all Americans, with allegiance to and pride in this country, even as we honor and respect the many cultures and countries that our families came from. curriculum planners. I took a class in Latin American Culture in college and it was a wonderfully enlightening course. But what we have here is something insidious and that is the reason that I thought it deserved a blog. All Americans, left, right and hyphenated, should be outraged that our public school tax dollars are being used to teach disdain for the United States and the overthrow of our government. “Sowing of seeds of hate” has nothing to do with ethnic studies; it is an attempt by socialist radicals to use our youth as pawns in their war against capitalism and the existing power structures. In a country that has wiped out all my history, stifled all my pride…. One note, especially to those young chicanos, hard drugs and the drug culture is the invention of the gringo because he has no culture. We have to destroy capitalism…The Declaration of Independence states that we the people have the right to revolution, the right to overthrow a government that has committed abuses and seeks complete control over the people. This is in order to clean out the corrupted, rotten officials that developed out of any type of capitalistic systems. being used in five different classes with kids as young as 3rd grade. instead of a social studies course that retires general education requirements. The good little soldiers of the Mexican-American Studies program swarmed the meeting chanting “fight back” and chaining themselves to desks in the meeting room. The meeting had to be rescheduled. But things only got worse at the second meeting, when the riot police had to be called in to deal with the protesting youth. The following video does a great overview of what happened. And you will notice that many of the concerned officials are in fact liberal Democrats. This is not a red / blue America issue. This is a red, white and blue America issue; which flag do our schools teach allegiance to? involved in their kids’ schooling. Not everyone can afford private school (biting tongue on vouchers diatribe), and not all parents have the time or resources to home school. Public school is the only option for many parents. But if parents send their kids off to school with no self-appointed oversight on what their children are reading and learning, than the parents have tacitly given consent to whatever indoctrination a rogue instructor or course teaches their children. I am not a parent yet, so I don’t want to sound preachy on the subject, but do you look through your kids’ textbooks? Do you ask for a class syllabus? Do you discuss what they learned in school today with your children? Do you ever attend school board meetings? Not only will staying involved with your kids’ education make them more likely to succeed in school, parents are the first line of defense against the infiltration of our education system by radicals or wackos teaching your kids values that do not match up to your own. Like many people, I have been watching closely what has been going on in Wisconsin and in other states with public employee pension reform and protests. I understand that most conservatives believe that public employee pensions and benefits are bankrupting our states and that the system is unsustainable. I know that many on the liberal, pro-union side feel that this is an attack on unions and their power to prevent unions from giving so much money to Democratic candidates and causes. Many states are in fact broke and public employee benefits are a part of that. Nonetheless, many of the protestors are just hard-working public employees who feel they deserve the right to collectively bargain on pensions and receive what they were promised. So where is the common ground? I would like to believe that we can start out by acting as adults in this discussion and that we can expect our law makers to do the same. I don’t have a problem with the protests. Protesting is as American as apple pie. Tea Partiers and pro-union protestors may disagree on many things, but both should feel empowered by their constitutional right to free speech, to peaceably assemble, and to petition government for a redress of grievances. What I do find irksome is the Democratic Senators in Wisconsin and now in Indiana that have fled the state and gone into hiding so that they cannot be compelled to vote on the bill. Isn’t that a slap in the face of our constitutional republic? The way it is supposed to work is that the people elect the representatives and the representatives vote on bills. Thus, which ever point of view garners more votes on election day gets more decision-making power in governing. Whatever the elected representatives think of Governor Walker’s bill, they get to offer amendments and then vote up or down. They shouldn’t run from that responsibility just because they are afraid of the result of the vote. In 2008 voters ushered in large Democrat majorities that passed bills that Republicans were adamantly opposed to. Now Republican majorities hold the high cards and the Democrat legislators have to deal with their loss of power. That is the way our system works. That’s why they say elections have consequences. If, or when, the Democrats get power again in Ohio, Indiana or Wisconsin, I imagine they will propose bills to return bargaining power and or benefits to public employee unions. It will be their right to do so. For the most part, political candidates explain their opinions and intentions to voters and the voters decide whose plans they would like to see come to fruition. If voters don’t like how their representatives vote, they have the chance to throw them out of office the next election. Legislators running and hiding from voting is not part of the equation. On a side note, I am equally perturbed by striking teachers getting fake doctors notes to avoid penalty or termination for their absences. If I were a student in one of their classes I would take that as a clear message that fraud is okay, as long as you believe in your cause. 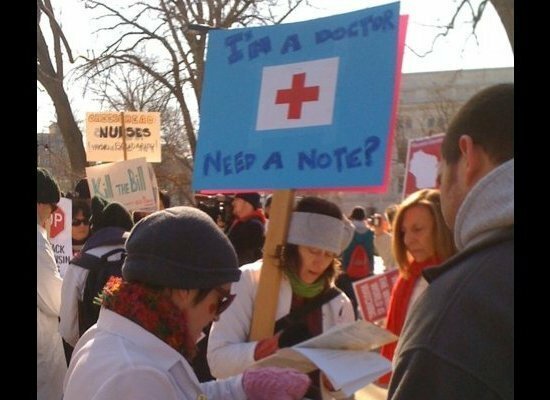 I wonder how that same teacher chides the next student to bring a fake doctor’s note to class for an unexcused absence. Certainly if I was caught lying to my boss about my absence I would expect to be reprimanded or likely terminated. All Americans, red and blue, most hold ourselves to the highest standards when fighting for what we believe in. The ends do not justify the means. I find tea party signs comparing Obama to Hitler or Stalin as disgusting as the signs in Wisconsin comparing Governor Walker to Hitler and Mubarak. In order for productive debate and effective governance, we all need to disagree with honor. That includes both protestors and legislators. That must be our Purple Ground. We must remember that the “how” is as important as the “why”. Today’s column by HuffPost Business Editor Peter Goodman is both inspiring and a breath of fresh air. His blog is aimed at the role of journalists today, and how media today has contributed to the false notion that the important issues of the day can be divided into Left and Right. It’s an intelligent look at not only how journalists should cover these issues, but really, how Americans should approach them as well. In short, Goodman is saying it’s not about a bogus Left/Right framing. What’s more, it’s also not saying that all issues have a common center where the “answer” lies. It’s about our objectivity. We, like our nation’s journalists, have a responsibility to not rely on those sources with staked out ideological positions to think for us. Each of us can and should make our OWN ideological position. There are so many examples, many cited in his column, where the issues of our day are ridiculous to frame as Left or Right. And it’s just as ridiculous to say there is a safe middle for many of these issues. Here at PurpleGround, we are saying that our issues usually start with most Americans in agreement: The need to reduce the deficit, lower health care costs, reduce dependency on oil, secure our borders, reform education, generate job growth, etc. Goodman’s point is that we are doing ourselves a severe disservice to try and answer these issues in black and white, left or right terms – and it’s a cop-out to say the answer is always half-way between each position. Rather, by starting on the common ground on the importance of an issue, it should lead to a respectful dialog on the different approaches to the solution. And ultimately, it should mean an individual – be it an everyday American, a journalist/blogger, and especially an elected representative of the people – should make their OWN position based on what they have learned and gathered. When you fall into the ideological trap, you get backed into corners of believing your side has the absolute truth, and by adopting that truth as your own, you close yourself to alternatives. It is just as ridiculous for any liberal to say we can ignore the deficit, as it is for any conservative to say we should kick out all illegal immigrants. You debase the argument if you maintain that everything labor unions want is fair and necessary, as much as if you maintain that there should be a removal of all business regulations.